Abe was helping with Scotland and picked him up off the changing table. While arranging him in his arms, Abe’s hand must have slipped and Mr. Scotty fell about 3 feet to the floor. Way too sad! I’m afraid I hollered a bit too much at Hannah and Abe who were in the room. But mostly I felt bad that I wasn’t able to be everywhere at once. Poor Scotty. I asked Abe to tell me exactly how he fell and if he went head first or bottom first. He thought it was bottom first. So we watched Scotty for hours. We determined his little head would be okay. He didn’t display any concussion signs. But boy-howdy how I worried for a few days. I watched him and was aware Saturday night. Sunday… a bit cranky so I gave him Tylenol to make it through church okay. We’re never sure if he’s cranky from gas/reflux or something else. By Monday, I noticed he didn’t move his left arm as much as his right. I felt his collar bones to compare and his left clavicle gave with a slight buckle feeling. Not good. After lots of tears and talking to my nurse sister Amy, I decided to take him in. I was seriously so embarrassed to be going to the doctor again. In the past few weeks, we’d been there 4 or 5 times to the same doc. Reflux, well-check, under-tongue growth, med-check, etc. So, I cried. But was so grateful that I had listened to that prompting, because the doctor confirmed he had a fractured left clavicle. Boo. So sad. 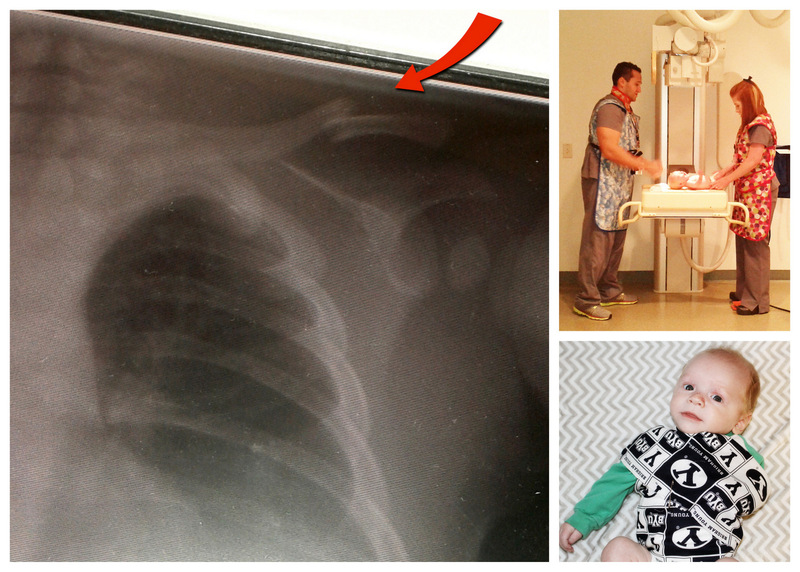 Dr. Foster sent us for a full skeletal x-ray at Primary Children’s Riverton. They were so quick and gentle with Scotty even though he cried through it all. Poor 9-week-old babe. No other bones were broken… so glad about that. Do babies ever tire of kisses? I hope not, because I keep kissing Scotty and apologizing for the accident and his pain. So sad. This too shall pass, and we will all be more careful. Poor Abe bawled his eyes out about the incident. He felt so very bad for Scotty. Hannah and Abe have been very gentle with Scotland and I’ve taught them and watched them hold Scotland. They are both too nervous to hold him now, but hopefully as he gets older and stronger, they will be able to help with him again. We love you baby Scotty! We’ll do our best to watch over you and try not to have any more accidents. Poor thing! My newborn (#4) had a broken collarbone; it either happened at birth (though it was a c-section) … or in that first week. My ped said that it’s sad, but the collarbone is one of the bones that heals so quickly and easily. I ended up not doing anything differently with him except just keeping from yanking too hard on that arm, and he is great now. My then three-year-old broke her collarbone a few months later (she was trying to jump from one piece of furniture to another, undershot it, and landed hard on her arm, buckling her collarbone) (at least, that’s what I think; not like I was actually in the room, supervising her!) :-P She wore a sling for 3-4 weeks but that’s all that was needed to heal up. When my pediatrician explained how the body heals this particular break — “it’s like little elves come in and plaster directly on the bone!,” I couldn’t help but think: God is a master healer!